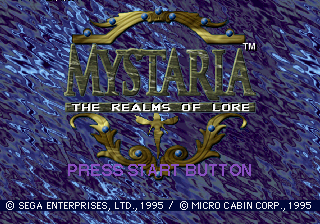 Mystaria: The Realms of Lore, originally released as Riglordsaga (リグロード サーガ) in Japan, is a strategy game developed by Sega and Microcabin for the Sega Saturn. Two versions of the game were released in the US: one titled Mystaria: The Realms of Lore and the other as Blazing Heroes. The sequel, Riglordsaga 2, was only released in Japan. A soundtrack album, Riglordsaga Original Soundtrack, was released in Japan shortly after the game. Main article: Mystaria: The Realms of Lore/Magazine articles.